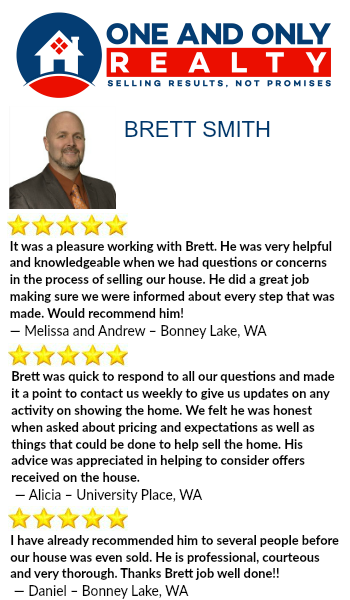 Whether you're buying or selling a home in South King County or Pierce County, having an experienced and knowledgeable real estate agent on your side; someone who will put your mind at ease and help to make your real estate experience exciting and enjoyable. With over 600 homes sold in my career, I love using my knowledge and passion to help home sellers and buyers. I love real estate and my priorities are simple – to help every client I work with to be successful in buying or selling a home. I love going the extra mile and bringing honesty, compassion and knowledge to the table. My goal is to empower people to realize their real estate dreams while making informed decisions. I believe in using the utmost consideration for what is in the best interest of my clients. Contact The One and Only Realty today and let us guide you through your real estate experience. All $1500 home buyer rebates are to be paid after successfully closing on buyers home purchase while working with One and Only Realty as your home buyers agent.